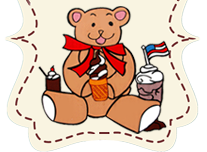 Debbie’s offers a wide variety of rich delicious Ice Cream Cakes, Ice Cream pies, and other Ice Cream Novelties. Orders typically require 24 hours’ notice. However, specialty cakes and character cakes require additional time. All of our cakes have a layer of Rich delicious chocolate ice cream on the bottom, a layer of fudge and crunchies in the middle, a layer of Rich delicious vanilla ice cream on top, and then they are topped with white icing. You can choose the color of the trim and the design or character you want. The ice cream layers can be substituted for Rich flavored ice cream such as banana, peanut butter, raspberry and other flavors. In addition to ice cream cakes, Debbie’s create made to order Rich delicious ice Cream Pies. They have a graham cracker crust and you choose the ice cream and candy decorations and flavors. We also have Rich ice cream sandwiches, ice cream cupcakes and our famous Debbie Bars and Buddy Bars. Ice Cream Sandwiches, Debbie Bars and Buddy Bars. And stop by for Windy Knolls Hand Churned Ice cream in 48 oz.